Check out our Storify of the events Ruth Evans organised on Young People’s Psychosocial Wellbeing, Care and Support with ODI, London in November 2016! 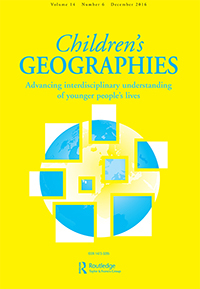 We are pleased to announce that a selection of papers presented at the Family Troubles symposium held at the University of Reading, September 2015 will be published in a special section of Children’s Geographies journal, entitled, Family ‘troubles’, care and relationality in diverse contexts, edited by Ruth Evans, Sophie Bowlby, Lucas Gottzén and Jane Ribbens McCarthy. We will keep you posted on progress!